A step-by-step playbook on how a Techstars growth mentor grows startups from idea to seven figures. The exact process used to grow VC-backed startups and Fortune 500 brands is detailed in this book. Lots of startups fail because they make the same mistakes around growth. You will learn how to avoid those. You will learn how to maximize your efforts as a marketer by being data-driven in your actions and optimize for speed and explosive growth. Detailed examples of how B2B and B2C startups have applied this growth framework. 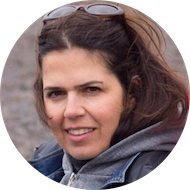 Usually only reserved for startup accelerators, you’ll get an exclusive growth marketing workshop from the author. 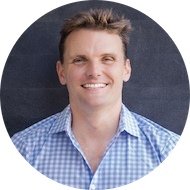 Access to the exact growth template, tools and resources used by a growth agency to scale startups. 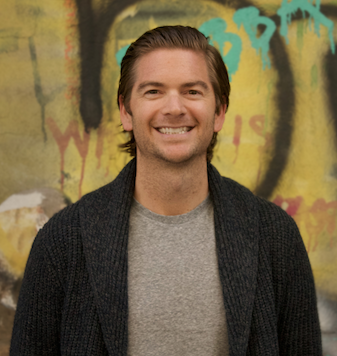 Jim has scaled a startup from idea to 7 figures and advised fortune 500 companies. If I was a CMO his material would be mandatory for my team. Jim’s approach to growing businesses makes executing your own marketing plan a straightforward process that anyone can do. 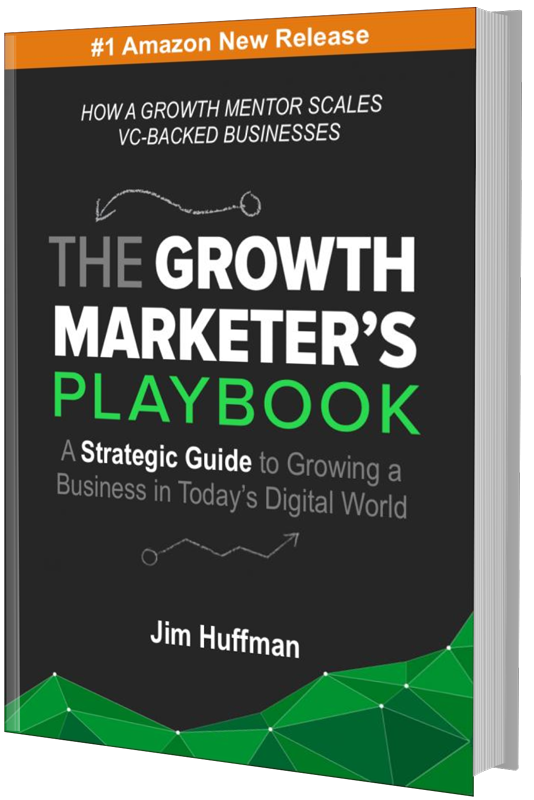 Anyone that’s looking to accelerate their knowledge in growth marketing should read this book. 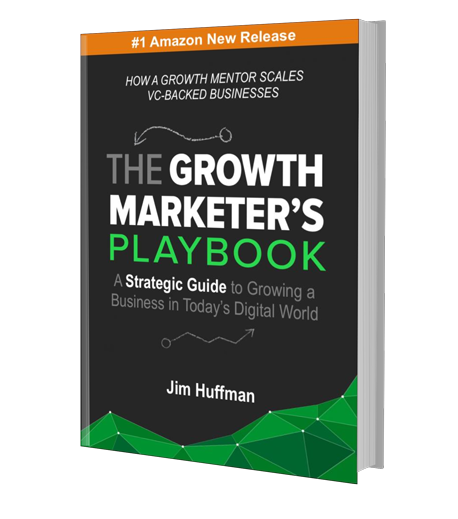 Jim represents a new breed of data-driven marketers who has used an agile growth framework to build real businesses. 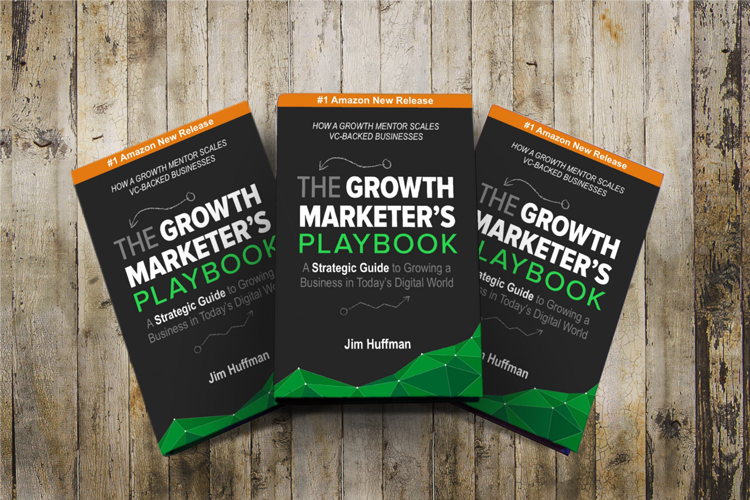 Jim Huffman is the CEO and cofounder of GrowthHit, a growth marketing agency. 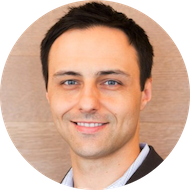 He is a growth mentor for the Techstars accelerator and the Sephora Accelerator. Jim also teaches marketing workshops at General Assembly and through the Association of National Advertisers. Everything You Need to Grow an Online Business like a Fast-moving Startup. 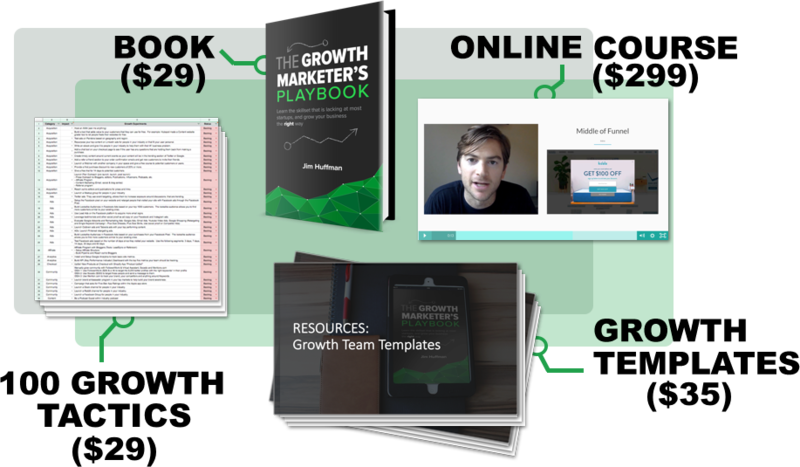 If You Want a Smaller Package, Here’s the Book and Growth Resources. 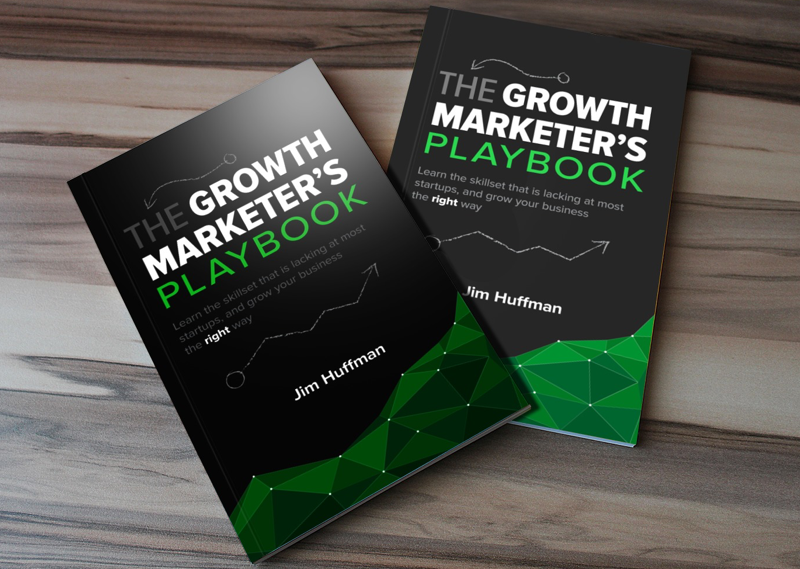 Includes The Growth Marketer's Playbook, the master growth marketing spreadsheet with 100 growth marketing tactics, a growth reporting template and growth management tool. This package is $89 but you can get it for $29. Limited time only. The 80% OFF Sale is Only Available Here. © Copyright GrowthHit LLC. All Rights Reserved. This website is operated by GrowthHit LLC. Throughout the site, the terms “we”, “us” and “our” refer to GrowthHit LLC. GrowthHit LLC offers this website, including all information, tools and services available from this site to you, the user, conditioned upon your acceptance of all terms, conditions, policies and notices stated here. In no case shall GrowthHit LLC, our directors, officers, employees, affiliates, agents, contractors, interns, suppliers, service providers or licensors be liable for any injury, loss, claim, or any direct, indirect, incidental, punitive, special, or consequential damages of any kind, including, without limitation lost profits, lost revenue, lost savings, loss of data, replacement costs, or any similar damages, whether based in contract, tort (including negligence), strict liability or otherwise, arising from your use of any of the service or any products procured using the service, or for any other claim related in any way to your use of the service or any product, including, but not limited to, any errors or omissions in any content, or any loss or damage of any kind incurred as a result of the use of the service or any content (or product) posted, transmitted, or otherwise made available via the service, even if advised of their possibility. Because some states or jurisdictions do not allow the exclusion or the limitation of liability for consequential or incidental damages, in such states or jurisdictions, our liability shall be limited to the maximum extent permitted by law. You agree to indemnify, defend and hold harmless GrowthHit LLC and our parent, subsidiaries, affiliates, partners, officers, directors, agents, contractors, licensors, service providers, subcontractors, suppliers, interns and employees, harmless from any claim or demand, including reasonable attorneys’ fees, made by any third-party due to or arising out of your breach of these Terms of Service or the documents they incorporate by reference, or your violation of any law or the rights of a third-party. These Terms of Service and any separate agreements whereby we provide you Services shall be governed by and construed in accordance with the laws of 2929 1st Avenue, #305, Seattle, WA, 98121, United States.